Despite witnessing volatility throughout the session, key equity indices advanced for the seventh straight day over sustained inflow of foreign funds and firm global markets. Almost all the Asian markets closed on a positive note while the European indices such as CAC 40 and FTSE 100 traded in the green. The S&P BSE Sensex closed 268.40 points or 0.70% higher at 38,363.47, while the broader Nifty finished 70.20 points or 0.61% higher at 11,532.40. 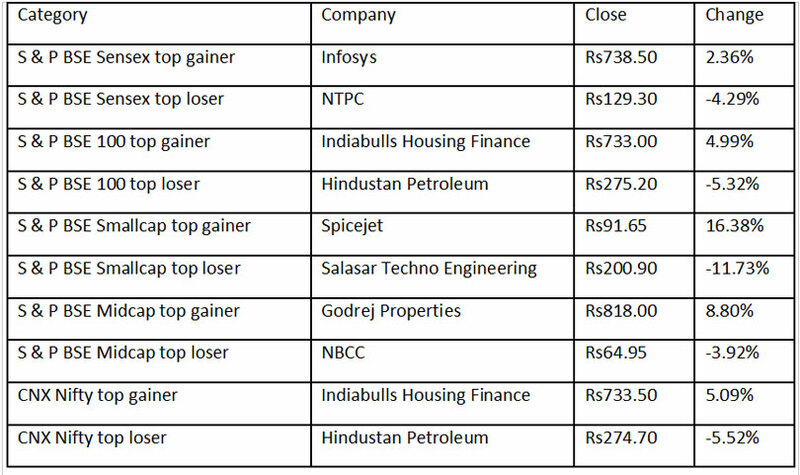 Among the top gainers were ITC, NTPC, HCL Technologies, Reliance Industries and Bharti Airtel were among the top gainers on the Sensex in the range of 1.81% to 2.45% while Bajaj Finance, Vedanta, Coal India, Bajaj Auto, Maruti Suzuki, Larsen & Toubro and Hero MotoCorp were the losers on the index (lost in the range of 0.15% to 2.10%). The US Citizenship and Immigration Services (USCIS) would start accepting new H1-B visa petitions for the fiscal year 2020 starting April 1, the media reported. The employment start date for these visas would be October 1, the American Bazaar daily reported on Monday. Like previous years, the regular visa cap limit for H-1B this year remains at 65,000. Additionally, another 20,000 petitioners, who possess a Master's, or a higher degree from a US university, will also get the visas. But, according to many lawyers, this year may be extraordinary, mostly because of the continued scrutiny as well as some subtle rule changes announced earlier this year. In January, the USCIS introduced a change in the order in which allocations would be counted. The agency will now put all the petitions including the ones with advanced degree in the regular cap. In the second round, it will select the remaining petitions. The new order is expected to increase chances of petitioners with a US Master's degree. This is likely to give a filip to Indian exports to the USA in all sectors. Union Civil Aviation Minister Suresh Prabhu on Tuesday directed senior officials to hold an emergency meeting on the grounding of flights by Jet Airways. The Minister for Commerce and Industry and Civil Aviation tweeted: "Directed Secretary, MoCA, to hold an emergency meeting on grounding of flights by Jet Airways, advance bookings, cancellation, refunds and safety issues, if any. "Asked him to get a report on Jet compliance issues immediately from DGCA (Directorate General of Civil Aviation)." The development comes a day after passengers were left stranded at Abu Dhabi as Jet Airways cancelled flights. The cash-strapped Jet, which has been forced to ground over 40 aircraft of its fleet due to non-payment of amounts outstanding to lessors, is regularly grounding aircraft as it is unable to pay the lessors. Industry sources said the airline had grounded over 50% of its 123 aircraft. On Monday too, following a similar pattern, Jet Airways informed BSE that four aircraft were grounded due to non-payment of money outstanding to lessors. Jet Airways shares closed at Rs228.10, down 3.65% on the NSE. Leading IT (information technology) services firm Mindtree on Tuesday said it condemns and opposes the takeover bid by Larsen and Toubro Ltd (L&T). "The attempted hostile takeover bid of Mindtree by L&T is a grave threat to the unique organisation we have collectively built over 20 years," the city-based company's promoters said in a statement. The statement was collectively issued by Mindtree's Executive Chairman Krishnakumar Natarajan, Co-Founder Subroto Bagchi, Chief Executive Rostow Ravanan and Executive Vice-Chairman Parthasarathy N.S. L&T bought Cafe Coffee Day owner V.G. Siddartha's 20.4% stake in the IT services company for about Rs3,300 crore, in a bid to acquire the firm. "A hostile takeover by L&T, unprecedented in our industry, could undo all of the progress we've made and immensely set our organisation back," Mindtree's top executives said in the statement. MindTree shares closed at Rs944.50, down 1.87% on the NSE. Larsen & Toubro shares closed at Rs1,359.95, down 1.37% on the NSE. Muthoot Capital Services Ltd (MCSL), the non-banking finance company (NBFC), here announced conclusion of a Rs236 crore two-wheeler securitisation deal with HDFC Mutual Fund (HDFC-MF). "This deal is one of the largest securitisations deals in the two-wheeler finance space and the biggest securitisation transaction so far for MCSL," a company statement said. "HDFC-MF subscribed to the entire issuance. The underlying loan pool received from Crisil an AA rating, a significant achievement in this asset class," it said. Muthoot Capital, the micro-financing arm of the Muthoot Pappachan group, is primarily into auto-finance business. Securitisation refers to transactions wherein a lender sells a portfolio of future receivables, and has recently become a preferred mechanism for NBFCs to raise funds. Muthoot Capital has a portfolio of around Rs2,600 crore with 7 lakh customers, spread across 18 states, the statement added. Muthoot Capital Services shares closed at Rs884.30, down 0.50% on the NSE. The US dollar fell against most major currencies ahead of a two-day US Federal Reserve meeting. In late New York trading on Monday, the euro increased to $1.1337 from $1.1320 in the previous session, and the British pound fell to $1.3251 from $1.3285 in the previous session, Xinhua reported. The Australian dollar rose to $0.7099 from $0.7085. The US Federal Reserve Open Market Committee is scheduled to meet on Tuesday and Wednesday, with market participants focusing on the Fed's policy statement at the end of the meeting. Investors have broadly expected that the Fed would remain its current benchmark overnight interest rate range. The US dollar bought 111.40 Japanese yen, lower than 111.49 Japanese yen of the previous session. The US dollar fell to 1.0010 Swiss francs from 1.0022 Swiss francs, and it was up to 1.3351 Canadian dollars from 1.3345 Canadian dollars.